This Clan Crest sporran is perfect for your next clan gathering! This Clan Crest sporran uses a high quality smooth black leather front and back. The flap features a mounted pewter clan crest badge of your choice with red background. The red creates a dramatic contrast between the badge and the background. The front has an embossed belt loop similar to all Scottish clan crests. This Clan Crested Sporran features : * Back - Smooth Black Leather (unlined) * Front - Smooth Black Leather * Tassels - None * Badge - Clan Crest Badge (A.P.S.) 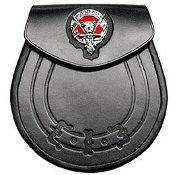 Badge List * Emboss - Clan Crested Outline with Red Foil Please Note: We use Premium North American Full Grain Leather in manufacturing this item. The natural characteristics of genuine Full Grain Leather are considered nature's signatures, with occasional markings. Please refer to item number MSL-1030 if you have any questions.